So you wanna hunt some Chompies, eh? First off, you must have already completed the Big Chompy Bird Hunting Quest. If you've already finished that quest, you should already have the requirements of 5 Fletching and 30 Ranging. You can begin hunting for Chompy Birds in the Feldip Hills area, where you found Rantz in the quest. Hunting for Chompy Birds takes place in the Feldip Hills, which is located south of Yanille and east of the Ogre City called Gu'Tanoth. Chompy Bird meat heals 100 Life Points when eaten, which is helpful since you're near some vicious Wolves and Ogres. Be sure to check out the map of the entire Chompy Hunting Grounds if you need any help! 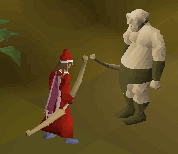 You'll need an Ogre Bow, which you obtained from the Big Chompy Bird Hunting Quest. You can also make a Composite Chompy Bow after completing the Zogre Flesh Eaters Quest. The Composite Bow shoots twice as fast as a regular Ogre Bow. Secondly, you'll need some Ogre Arrows. To make these, kill some Wolves and use a chisel on their bones to make the Ogre Arrow Tips. You'll make about 2-6 each time. To make the Shafts, cut an Achey Tree from near Rantz and fletch them into arrow shafts. Add feathers (4 per arrow) and the tips to finish the arrows. Finally, you'll need a pair of Ogre Bellows from the quest. If you don't have any, just go into the cave near Rantz and open the chest in the large room to get a set. Now you need to get some Bloated Frogs. Go to the swamp area and use the Bellows with the swamp bubbles to fill them with gas. Now use the Bellows with the Swamp Toads to get a Bloated Frog. Collect 3, as that's as many as you can hold at once, and head a short distance north to the forest. Place a frog on the ground and 'hide' in the forest a short distance away. 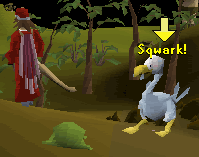 If a Chompy Bird doesn't show up after awhile, try moving around a bit. Once a Chompy flies down, start shooting at it with your bow. It has 100 Life Points, and you shouldn't have much of a problem killing it. After you've killed it, pluck it to get some feathers. You can also take the bones and raw Chompy Meat that it drops. 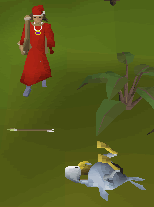 Every time you kill a Chompy Bird, your character will cut a notch in their bow to mark how many kills they've had. You can check how many kills you've had from the right-click menu of your bow. Once you get enough kills, Rantz will give you a Chompy Hat to show off your expertise. They're made up of a headband and a certain number of colored feathers, depending on how many kills you've made.